I had already read many of these before getting my hands on this collection, and some I had read a few years ago. 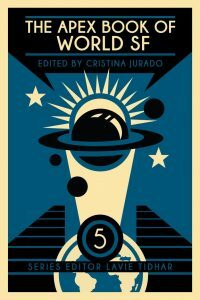 WSF5 was an opportunity for me to reread those stories (which I rarely do these days because my TBR stack is always yelling at me). In many cases, I loved the story even more the second time. Fujii’s “Violation of the TrueNet Security Act” is always a fun, gripping piece, but now that I’ve also read Gene Mapper and Orbital Cloud, I can better appreciate Fujii’s ability to seamlessly weave in discussions about code into his larger story of a post-Internet world. His hard-sf stories are such a joy to read. Colanzi’s “Our Dead World,” too, was even better the second time. I had first read it in her collection of the same name, but reading it in relation to other writers’ stories offered an interesting new perspective on her tale of Mars and the stress of living on another planet. I first encountered Chi Hui’s “Calculations of Artificials” and Karla Schmidt’s “Alone, On the Wind” in audio versions, and reading the text allowed me to notice details that I had missed before. Chi Hui’s chilling and sorrowful story about “artificials” trying to keep humans apart (so they wouldn’t kill each other in yet another nuclear war) goes to the heart of what it means to be human and come into conflict with other humans. Does the elimination of violence and acts of rage mean that the species has changed beyond recognition? Can such elements ever be purged from humanity and should they? Like Chi Hui’s story, Schmidt’s is a long, complex tale about conflict and aggression, but this time the war is between humans living on a desolate earth and a different species of human living on the shattered rocks hanging above the earth. We so rarely get German SFT these days, and “Alone, On the Wind” is a lovely example.